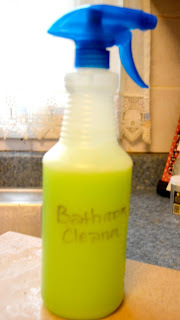 I used to have a favorite commercial brand bathroom cleaner. It was just a store brand but it really was the best I have ever used for cleaning the bathroom, especially the grout lines, but sadly it is not made anymore so I have been searching for that perfect replacement. I saw this "recipe" on Pinterest and decided to give it a try. I liked that I had the ingredients already. 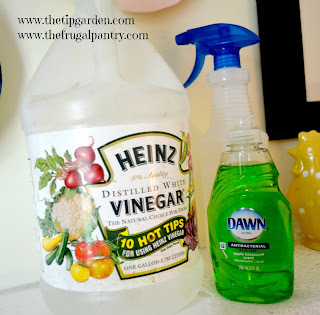 I use vinegar in almost all my cleaning somehow so decided to give it a go. I mixed it up and tried it out. My conclusion? Pretty darned good! My bathroom tile was sparkling, and I needed only a bit of elbow grease on those grout lines, it all came clean! Since then I've been using it on wall smudges, and in the kitchen as well. I am liking it more and more every time I use it! I do feel I need a rinse down on the cleaned surface just like you would with any cleaner. To me if you want to try it, mix 1/2 cup of each and give it a trial run and see for your self! 1 1/2 cups (12 oz.) dawn dish detergent. Gently mix the two together in a spray bottle and it is ready to use!